Project Portfolio Management is a popular term which refers to manage a group of interrelated, dependent, and connected projects. PPM seeks to obtain the highest level benefit by prioritization and sequencing of projects. Although the projects of an organization are often considered as discrete and independent units, in fact they are interdependent. Projects often affect each other in different levels considering the shared resources and funds. Assume that your organization has 10 ongoing but different types of projects which are all overlapping, most of them are using the same equipments and some of them will be built for the same client. Without having a proper Project Portfolio Management system in place, it will be difficult to deliver them on time and budget. A Project Portfolio Management Software may be helpful for an effective planning and prioritization. Before to make an investment, owners and funders always focus on the financial returns that the project will provide. Making good decisions carry an organization forward and help to stand out among its rivals. On the other hand, bad decisions and mismanagement usually cause failure. That’s why effective Project Portfolio Management plays a key role for project selection and execution success. A portfolio may include many projects and programs which can be related or non related. Business, profit, non-profit, government, construction, IT, security etc. projects may be kept under the same portfolio. Portfolio management aims to identify, prioritize, authorize and manage projects and programs to achieve the organizations operational and financial goals. What Is a Project Portfolio Management Software ? There are many softwares available on the market for Project Portfolio Management. They have various capabilities and solutions to serve your organizational decision making. A Project Portfolio Management Software may be useful for an organization, but completely useless for another. Selecting the best software depends on your organizational requirements, your situation and how many projects your organization have. It will be beter for you to ask below questions yourself before to choose a Project Portfolio Management Software. Why do we need this software ? Is a web based software necessary for our organization ? Does a non web based software provide enough solutions ? Does this software provide worldwide solutions ? How many people are using this software ? 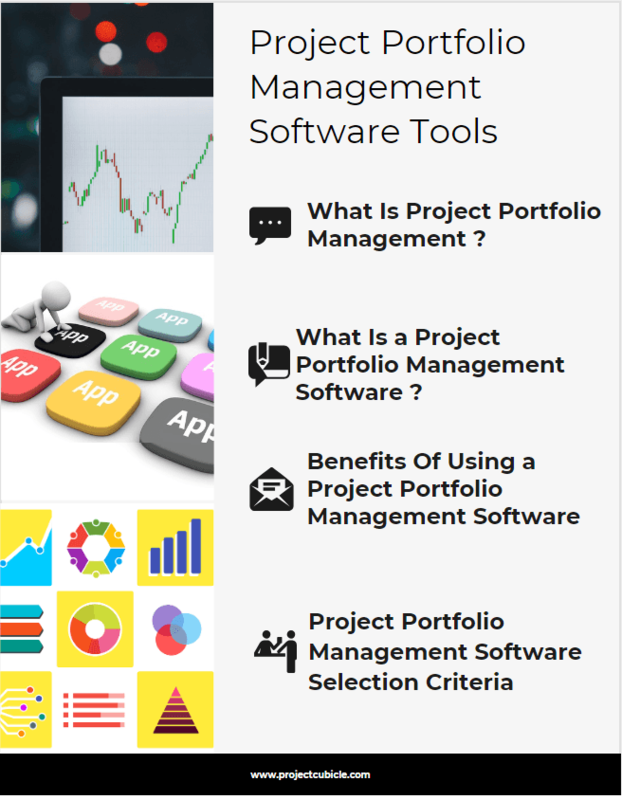 The answer of these simple questions provide you a general overview on the type of different Project Portfolio Management Softwares. Thus, you will understand what solutions and tools you’ll be needing. Which One is The Best Software ? Although the softwares available on the market provide similar solutions, their capabilities and power are different. For example one software may provide advanced cost management solutions, but it may be difficult to use. Therefore the term”best” is very subjective considering different requirements of organizations. Microsoft Project also has project portfolio management capabilities if it is used in conjunction with the Project Server. It is a good idea to check out the demos and try the free trials offered by many project portfolio management software developers before to make an investment. When you analyze different types of softwares maybe you will decide to buy a project management tool instead of a Project Portfolio Management Software. Some of the project management tools have limited PPM capapabilities like managing activities and resources across multiple projects. Note that this article is not a product review. Therefore, our purpose is to provide you a general idea to select a project portfolio management software rather than giving names. Using a Project portfolio management software provides many benefits to portfolio managers and organizations such as prioritizing and managing high-value projects among others. Regardless of how well your organization perfom projects, you need a project portfolio management software to determine the over-allocated resources. PPM Softwares help to plan and deliver multiple projects using Scrum, Gantt, Kanban, Waterfall methodologies. Web based PPM Softwares enable to manage projects in real time. Most of the web based PPM Softwares have mobile app that enables you to manage your projects, and collaborate on the go. Most of the PPM Softwares enables to use Excel spreadsheets to import or export data. This function helps to make updates quickly. PPM Softwares have advanced reporting capabilities which support decision making. While choosing a software, below selection criterias will help you for choosing the best one. Resource management : Resource managment tools of PPM Softwares help you to schedule the resources and determine the over allocated resources. Cost management : A PPM Software must be capable of supporting financial decision making. Almost every software have cost management tools, however, the one which have advance financial projection capabilities is the most useful. Risk management : There is no risk-free project available in the world. Risk management tools of PPM Softwares help you to classify and manage risks across multiple projects. Reporting Features : Financial and schedule reports provide invaluable information regarding to the performance of the projects. PPM Softwares with high reporting capabilities provide visual reports as well as spreadsheets. Integrations : A PPM software should have advanced import and export functions. It must work in conjunction with other softwares like excel, primavera p6 and microsoft project. Price : Price is an important criteria for selecting the software. You need to analyze the cost as well as the benefits of the software before to make an investment. In this article we discussed project portfolio management softwares, their benefits and the criterias to select the most useful one. Is your organization using a project portfolio management software ? If so what do you think about the capabilities of it ? You can share with us by using the comments box below. Next articleHow to Become a Project Manager ?